A zombie apocalypse thriller with a difference, The Girl With All The Gifts offers intellectual horror in a dystopian setting. From a familiar premise, the film progresses towards richly thought-provoking but still blood-soaked territory. In England, Melanie (Sennia Nanua) is among a group of children securely imprisoned at a government military base under the command of Sergeant Parks (Paddy Considine). Miss Helen Justineau (Gemma Arterton) teaches the kids, while Dr. Caroline Caldwell (Glenn Close) is the resident researcher. The children are all infected with a fungus that wraps around their brain and turns them into smell-triggered flesh-eating zombies, but as the second infected generation, they are displaying human traits and the ability to think. Melanie appears to be particularly smart and forms a bond with Justineau. Meanwhile Caldwell believes she is close to finding a vaccine, and just needs access to Melanie's brain and spine to complete her research. 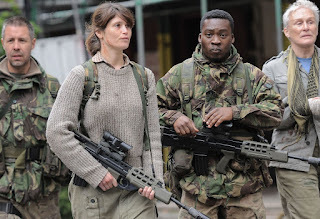 When the base is overrun by rampant zombies, Melanie, Justineau, Caldwell and Parks along with a few other survivors escape and must navigate the hostile countryside to reach a devastated London. 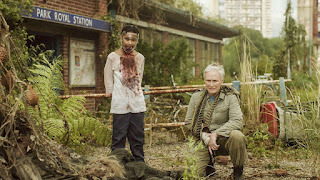 A British production directed by Colm McCarthy and written by Mike Carey (adapting his own book), The Girl With All The Gifts takes the zombie sub-genre to new places. Without sacrificing the blood, gore and horror of an entire country swarming with flesh eaters, the film pushes past the typical survivors' ordeal and delves into "what next" for the zombie species. With Melanie bringing to life the most sympathetic zombie ever to grace the screen, and a child no less, Carey takes the narrative towards questions about who deserves to live, and why. The film's set designs are astounding. Initially the story is confined to the bowels of a military base where the children are either confined to their cells or strapped to wheelchairs and shuttled around by heavily armed guards. Once the small protagonist group flees the zombie invasion and sets out to reach potential salvation in London, an imaginative vision of a destroyed civilization is brought to life, and a metropolis empty of humans and occupied by zombies in metamorphosis is chilling. 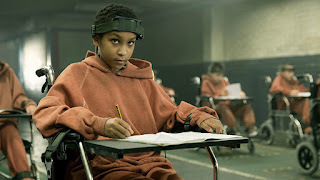 Despite the stunning visuals, the true strength of The Girl With All The Gifts lies with the characters. With Melanie clearly a bright spark navigating around her flesh eating tendencies while working to understand her role in the world, Justineau, Coldwell and Parks are a phenomenal triangle surrounding the girl, stressed by the struggle for personal survival and no less a task than protecting humanity. Justineau and Coldwell display opposite sides of the same human ideal, the educator displaying a natural nurturing tendency while the researcher is intent on sacrificing Melanie for the greater good. Sergeant Parks starts as the most cold hearted member of the surviving team. Initially more aligned with Coldwell in treating the children as creatures not worth keeping alive, his is an immensely satisfying evolution, as the soldier starts to understand and appreciate what Melanie brings to survival in the wilds of a destroyed civilization. McCarthy and Carey conspire to push hard on preconceptions as the film enters its final third, and succeed in undermining the natural order of evolutionary supremacy. With the zombies displaying symbiosis with nature and a capacity to amplify their killing power by harnessing primary elements, all ingrained notions of humans in their most familiar form holding an innate right to rule are toppled. The Girl With All The Gifts is willing to break all the archaic rules, with the strength of anarchic logic.